I love arugula! I mean obsessive love. The peppery flavor and delicate texture inspire me to include it in all possible recipes. I've even taught my kids to enjoy this healthy green. I've slowly added it into salads and pasta dishes until they've developed a taste for it. My son is a complete convert and my daughter is almost there. This hearty winter sandwich has so many complementary flavors; I don't know where to start. The spicy arugula is mellowed by the rich and velvety cheddar cheese and offset by the sweet and juicy pear. The honey mustard adds some needed tang and enhances the sweetness of the pear. It's yummy and so simple! I'm lucky to have a high quality Breville panini maker to create a grilled cheese with beautiful grill marks and a super crispy exterior. However, a cast iron or non stick pan will do an excellent job. Quick note regarding Arugula: smaller arugula leaves tend to be milder, while larger leaves tend to have a more aggressive, peppery kick. I lean toward the taste of the small baby leaves. If I'm using the larger leaves, I cook the arugula to create a more mellow flavor. Don't miss out on this mild weather green that packs flavor and nutrients in every bite. Mix mustard and honey together in a small bowl. Lay out 4 pieces of whole grain bread on a medium sheet pan. Spread two slices of bread with mustard to taste. Top each piece with one slice of cheese. Evenly layer pear slices on two pieces of bread with cheese. 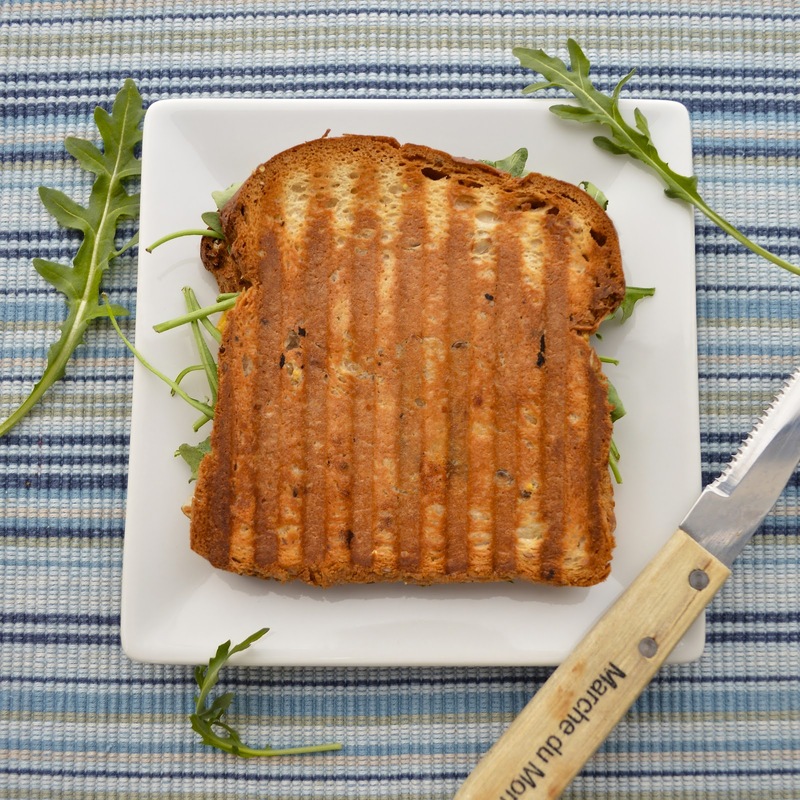 Take arugula and evenly divide between two slices of bread with pear. Take piece of bread with cheese only and place on top of arugula. Lightly brush each side of sandwich with extra virgin olive oil. Heat panini maker or pan to medium high. For panini maker, press down top onto sandwiches and cook for 4-5 minutes or until bread is golden brown and cheese is melted. For pan, cook sandwich for 2-3 minutes per side until golden brown and cheese has melted. Thank you! Hope you enjoy. What a shot!! I love this combo, what a treat!